On Friday, November 19, I will recreate a flavor of what rich and fashionable Hellenistic Greek society might have eaten. ~ Myma, a luxurious spicy dish made with chopped meat of chicken or sacrificial animal, liver, offals, blood and flavoured by melted cheese and 12 kinds of herbs and spices. ~Roasted suckling pig stuffed with hen breasts, thrushes and eggs. ~Bulgur cooked in a well sealed clay pot. ~ A dish of wild greens and cultivated vegetables. ~Voletinos bread, milled with ancient variety of wheat and baked in a sort of “clivanos” (ancient Greek portable domed clay oven); flatbread and a soft bread said to be typical of Cappadocia. ~Plakous, a cake made with fine flour, home made goat cheese and honey. ~ Gastris: a Cretan specialty made of various toasted nuts and seeds mixed with honey. Please make the reservations until 17th of November. evmarosart@gmail.com tel: 210 6207824. 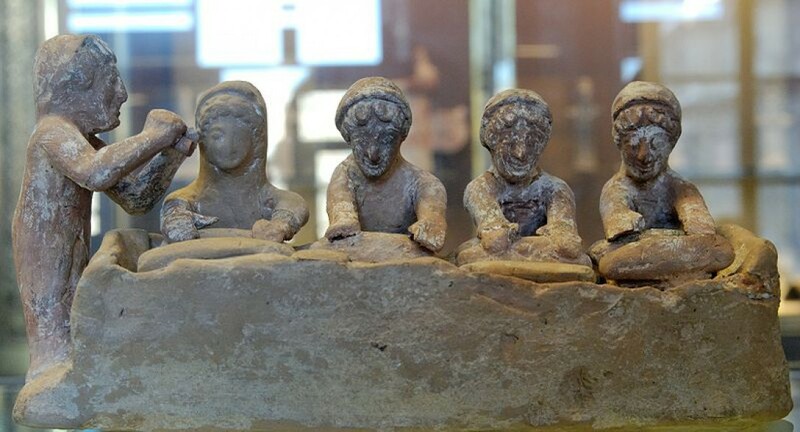 When Macedonian Caranous gave his wedding banquet, early in the third century, only 20 men attended as his guests. As soon as they had sat down, a silver bowl was given to each of them as a present. When they had drunk the contents of the bowls, then there was given to each of the guests a loaf of bread on a bronze platter of Corinthian workmanship, of the same size; and chickens, ducks, pigeons, and a goose and lots of other items. Each guest took the food and gave it, platter and all, to the slave who waited behind him. Many other elaborate dishes were also served. And after them, another platter came, this one was made of silver, on which was placed a large loaf, and on that geese and hares and kids, bread curiously made, and doves, and turtledoves, and partridges, and a great abudance of many other kinds of birds…..
A glimpse into the diet of the rich and poor of Constantinople in Komninoi times (11th – 12th century AD). Dinner at Evmaros, on Saturday, January 15, 2011. In 1081 the Komnenian dynasty was established on the Byzantine throne. Five emperors from this family ruled for 128 years, trying to restore the military, economic and political power of the Byzantine Empire, trying to reassess the Byzantine position in the eastern Mediterranean after the 1st Crusade and playing a balance -of- power game between east and west. Μoreover, the cultural impact of Βyzantium on the west and the lands around the E. Mediterranean Sea was enormous. This period is usually called Κomnenian renaissance and was the last period of prosperity in Byzantium. However, the majority of Byzantine population, the peasants, became poorer because the ambitious foreign policy was not only based on large cash reserves but also on intolerable fiscal pressure on Byzantine taxpayers. 11th century peasants in vineyard. On the other hand, the empire became a family institution and the only access to the emperor was mediated by his family. The Komnenoi rulers benefited the monasteries and the military aristocratic elite that was intermarried with them with fiscal privileges and extensive lands. By the 11th and 12th century the properties of large landowners consisted of large estates and entire villages. The continuing population increase- with human numbers rising in cities – increased the demand for food. This means that the landowners increased the areas under cultivation and since the development of cities and big part of the trade depended on rural population’s production, they pressed the peasants in order to produce more and more. As the capital of a powerful and rich empire, Constantinople was a bustling city of a population from 100.000 to 500.000 people, centre of the domestic and foreign trade of the Byzantine state. * Grain, wine, salt, meat, cheese, vegetables and fruits flowed from the provinces into its markets. From the 9th until the late 12th century the capital was also a most important entrepôt of the eastern and northern luxury trade. Spices and high -luxury foods (like black caviar) were imported. Merchants on a boat. Early 11th century, Cynegetica. Of course, luxury foods were cherished so dearly by both poor and rich, though only the wealthy landowners, the officials of the state and church and the rich members of the new urban middle class, the “mesoi”, could afford them. The “mesoi” were for the most part traders, craftsmen and businessmen and bankers but some of them made a considerable fortune and enjoyed their purchasing power demanding fine quality foods. **For a wealthy merchant the entry into elite was the ideal. Where this was impossible he emulated the tastes of the aristocrats, food included. If the hagiographers of 11th and 12th century maintained the traditional ideal of fasting, less conservative sources give a wealth of information about both the increased interest on eating and the greater availability of foodstuffs. The variety of vegetables, fruits and condiments- black pepper, caraway, honey, olive oil, vinegar, salt, mushrooms, celery, leeks, lettuce, chicory, spinach, turnips, eggplant, cabbage, white beets, almonds, pomegranates, nuts, apples, lentils, raisins, etc. -listed as food of the poor of Constantinople by Prodromοs (d. c. 1166, Poèmes prodr. nο.2.38-45) mirrors both the interest on good eating and the availability of dishes. Of course above all, the food in Constantinople of Komnenoi existed as a synthesis of what had gone before, but a synthesis enriched by new ingredients and many innovations. 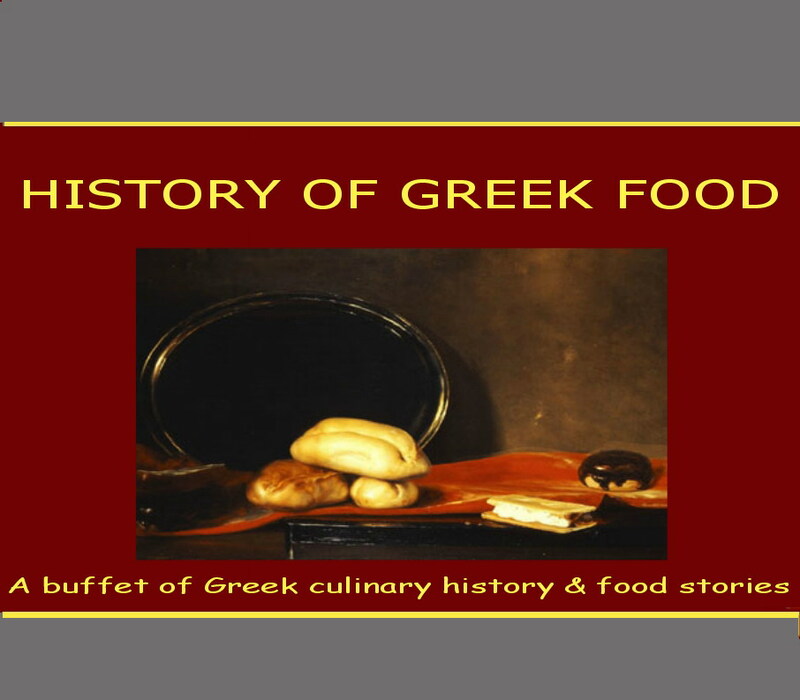 I came across your site, by chance, seaching on Ancient Greek recipes. I like very much what you do and would like to ask. Would consider catering one evening, for a group of up to 8 people, in Athens? I am glad I found this site…I have been puzzling over this question for weeks. What did the ancients do with all that olive oil they produced and transported all over the region? Were they deep frying a lot of chicken? I know it was used for lighting, also lubrication? Seems like a lot of oil was sailing back and forth across the Mediterranean, but I cant figure out how all it was used. Ancients used olive oil to cook and fry with and they served vegetables, wild greens and fish drizzled with it. Olive oil was also used as a base for making perfumes, cosmetics, ointments… athletes applied it on their bodies.